I love this vacuum. Spent twice as much on a different brand that was for peys as well. It doesnt compare to this vacuum. The hair comes up in onr swipe. 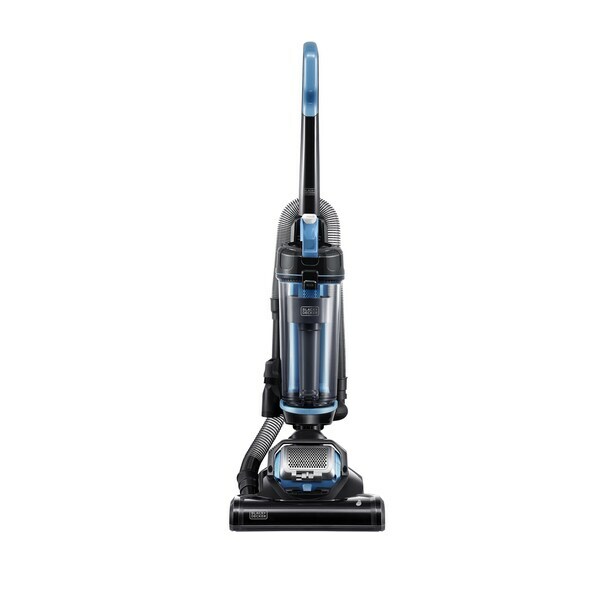 The Black+Decker AIRSWIVEL Ultra Light Weight Upright Vacuum Cleaner features 170-degree swivel steering. Unike traditional vacuums which typically require two separate motors to accommodate swivel functionality, the patented AirSwivel technology only needs one motor, allowing for maximum maneuverability and ease of use. I got this vacuum in January 2016 I've been using this as my primary vacuum for a year. I am happy with its performance does are remarkable job of picking up cat hair and dust. When I bought this I was living in my home through some renovations, anyone that's lived through a renovation will tell you that drywall dust is no joke! I needed a vacuum that could pick up dust and cat hair. Every day I would come home from work to find a layer of drywall dust, yuck! I love that you can see as the canister fills up, I was amazed at what came out of my two large throw rugs. This also works pretty good on my hardwood floors. The canister comes out very easily to empty out the dust. The filter lasts a long time and you can actually clean it yourself. I was online looking for a filter and thought I would leave a review for the vacuum. ( this is the first time I've replaced the filter, it would probably last me a lot longer if I wasn't vacuuming up drywall dust) The swivel head is excellent it can maneuver around chairs. This vacuum is also the best I've ever seen at getting things close to the wall. The dust always seems to end up in a corner or by the wall and I was surprised that this could pick it all up. I do need to use my arm strength on a shag rug I have. I don't necessarily think this is because of the vacuum I think it's more of the rug. The vacuum is light enough that I can pick it up place it in spot on the shag rug and pull it to vacuum that rug. My only minor complaint is you also have to use a little arm strength to pull the hose out of the vacuum to use an attachment. When I first got this I did trip over the cord a lot, until I realize there is a small hook on the back of the vacuum under the handle for you to put the cord as you're vacuuming so you do not trip over it. This is a great little vacuum for the price, excellent suction, being able to see one the canister needs to be emptied and the ease of emptying it, the long cord, in the swivel head feature to name a few. The Black and Decker Airsweivel Ultra light weight Vacuum cleaner was purchased after our other vacuum stopped working. So far i have no complaints with this vacuum, it performs as expected, with no problems as of yet. This Black and Decker vacuum is great It truly is light weight making vacuuming less cumbersome.The air swivel is a great help.It allows you to vacuum haerd to reach areas.I have had it for months and it works great.This is a great product at a good price. Light weight, easy to use and assemble. This vacuum sucked dirt out the floor i had no idea was there. This is the best purchase I have ever made! I recently downsized from a huge family-sized house to a two bedroom/two bath apartment. However, I have two cats...Always need to vacuum cat hair on the carpets and cat litter on the hard surface floors. This vacuum cleaner does the job. Only one drawback (and it's really small)....It has a short power cord. Need to plug in again in every room where it is used. It has great power and moves easily between carpet and hardwood. For the price...it is wonderful! Very light weight!! Easy to use! This is a great product. Very easy to assemble. There was only one screw needed to assemble it. It’s very lightweight and easy to maneuver. This vacuum was pretty powerful for its size. I still have it a year later but it is wearing out. My daughter used it everyday The tube can be a little narrow and you gotta clean it out if it gets clogged. that didnt happen too often though. Well put together! Great product!!! I like this little vacuum. It picks up very well and is easy to transport. It's a good light weight vacuum, hard to push on thick carpet. I got this as a gift for my daughter. I took it to her and tried it out. It's very light in weight, but it did a good job! It really surprised me how much it picred up. I purchased this vacuum for my niece who has two cats, one dog, three boys from three to thirteen, and a messy husband. Her previous vacuum couldn’t handle it and quickly broke. This vacuum has held up to the task at hand very nicely. This was a great purchase, the lightweight vacuum does what its intended and better yet, it swivels. I would purchase this as a starter vacuum for smaller places. Great vacuum. I purchased this for my college daughter who needed one for her dorm. Great for teenager in college. Works really well in my apartment! Not so great in houses. "Does this have attachment hoses"
"I purchased this vacuum a couple months ago and it is already broken. I need to go to Black and Decker, I believe. Please send me a copy of the original order. I have had to resort to using a Dirt Devil that I bought over ten years ago and it still works fine. What a disappointment for a first time purchase from Overstock." You will be contacted by Customer Care who can assist you further. Have a great day. "How long is the power cord?" This item features a power cord approximately 20 feet long. "How many amps is tis Black and Decker?" Hello jackleonard, the amperage for this vacuum is (7). Please let us know if you have additional questions. Thanks for shopping with us! "how many amps is this black and decker vacuum?" Hello Linda, unfortunately this item is out of stock. We currently do not have inventory to check, and cannot guarantee the item will be restocked. Thank you for shopping with us. Well I had bought a while ago a Bissell and wasn't very lucky with it, Black & Decker seems a brand name that I allways purchase so i'll give it a try.